In my 30-something years of life, I've played a lot of video games. They've brought me a lot of joy and happiness, inspired me, let me visit exciting and fantastical worlds, told me amazing stories, and allowed me to vicariously live exciting lives. It's given me a lot. However, I've never really known how I could give back with gaming, until now. 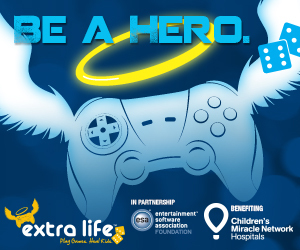 On November 2nd every year, there is a charity gaming marathon hosted by Extra Life. It works just like any other marathon; I ask for pledges, people donate to support me, and all of the money goes to charity. On November 2nd, I sit down at 8am, and I play a game for 25 hours straight. I will of course take the occasional break for stretches, brisk walks, bathroom, and food. But I get absolutely nothing out of this, apart from the good feeling of knowing I did something to genuinely help people. While I'd heard of Extra Life before, it was my dear friend Kaylei Bristol that really cued me into the details behind the cause. She has done it before, and wound up raising over $600 when her goal was $250. She had a wonderful time, and encouraged me to join. All of the money goes to the Children's Miracle Network. I've heard a lot of things about various charities being shady in their business practices, so I did my research. These guys are the real deal. On the Charity Navigator, a watchdog rating site for where money goes and who benefits, CMN ranks 4 out of 4 stars. These guys are legit, and have little to no agenda. They give their money directly to the hospitals, keeping a bare minimum to keep their operations running. CMN is completely open about their records, and are fully accountable for every penny. They don't discriminate on religion or politics, they just want to help. And so on November 2nd this year, I'll be joining in the fight. I have seven months to rally up some pledges, and it's already going strong. If I hit my goal? I'll just raise the bar higher! I have not yet chosen a game; I will do so at least a month from the date. Not sure what I want to do; something story based to play through? Maybe an open world to screw around in? Or maybe start a new world in Minecraft? I don't know. What I do know is that it will be something on PC, and I will stream the whole thing live on Twitch.tv with headset, so donors can pop in at any time and see how I'm doing. I'll keep my laptop beside me, so that I can monitor the chat and interact with people. So if you would like to help me reach my goal, chip in for a good cause, here is my personal Extra Life profile page. Please help out if you can, even if it's only a couple of bucks. It's all going to a great cause, and it's completely tax deductible!